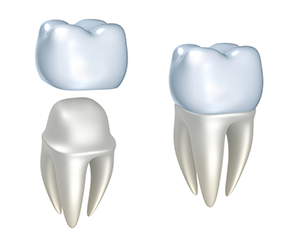 Dental crowns are a good option when a tooth is fragile or damaged or you want to correct a cosmetic issue. Dr. Steve Pleickhadrt, your Gainesville, VA dentist at American Dental, explains how you can benefit from a crown. The first step in the dental crown process involves decreasing the size of your tooth to ensure that the crown will fit over it easily. After your Gainesville dentist files your tooth, he'll make an impression of your mouth, which will be sent to a dental laboratory that creates the crown. You'll receive a temporary crown, which you'll wear for the next two or three weeks until your permanent crown arrives. When you return to your dentist's office, he will test the fit of your new crown and make adjustments before permanently attaching it to your tooth. Crowns offer an excellent way to protect teeth and improve your smile. Call Dr. Pleickhardt, your Gainesville, VA dentist at American Dental, at (703) 753-6695 to schedule an appointment. Restore your smile with dental crowns!